The best RHEL clone for Desktops, Scientific Linux 5.5 is released! Based on well-tested RHEL 5.5 source (plus some inhouse additions), it's perhaps the only RHEL child that works out of box. In fact, every thing including Wireless, Bluetooth, multimedia codecs, compiz, application programs, sharing, windows partition access (fat32 and ntfs) and other important stuff that any desktop user ever needs, is bundled with utmost care, without loosing RHEL stability. Urs Beyerle announces "Scientific Linux Live CD/DVD 5.5 has been released for i386 and x86_64. Features: live CD can be installed to local hard disk; live CD runs from USB key; changes can be stored persistently on an external device; live CD can be mounted over NFS (diskless client). Software: Linux kernel 2.6.18, OpenAFS client 1.4.12, X.Org 7.1, ALSA sound libraries 1.0.17, GNOME 2.16.0, GIMP 2.2.13, OpenOffice.org 3.1.1, Firefox 3.0.19, Thunderbird 2.0.0.24, KDE 3.5.4 and Evolution 2.12.3"
For more, read the release notes. Here is a great review on its previous version. While Linux is growing leaps and bounds (by feature and performance; not deployment, Redmond still rules the race and will probably do the same for quite long), it's time we spread the same in the mass psyche, public mind share. So, where do we start? Noobs? New converts? Non-profit, governmental organizations? Or from the top, the busy Enterprise Linux server room managed by a traditional server guy? To me the latest seems a good starting point. Now let's define who a "Traditional Server Guy" is? He is one who oversees all the server tasks, manages jobs, assigns works to the 2nds in commandment. He is a busy person who deployed Linux desktops couple of years back somewhere across some user desktops and has no time to either catchup with the recent advancements or to maintain the leftovers. He still believes CentOS 4 is the most stable desktop around and assumes ver.5 is still in beta (point to be noted, CentOS 6 beta might be brewing in devs' circles). Puns apart, he has been managing the business well, so he has a better command over all the departments. Here is a few of his theories that coincides with traditional rules of Linux, that have long been challenged and changed. Performance is squarely dependent on the proximity of hardware-software timeline. In other words, a dated software works better on a dated hardware. Conversely, a new and shiny hardware needs the latest software. Latter is 100% true. But not the former. In theory (and in reality) it was recommended that the user should install a contemporary linux OS in relation to the hardware, and it was really a good advice. But slowly the paradigm changed by many factors. 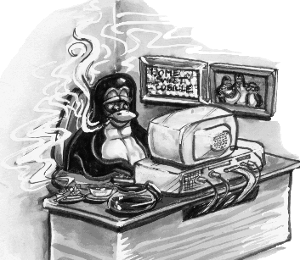 In recent years there has been enough refinement on how linux handles drivers, manages system memory and prioritizes tasks on desktops; this ball game was changed to a great deals after kernel version 2.6.31. Of course, kernel alone is not solely responsible for this sweet change, there are tons of changes in userland and system scripts. I have seen the dated computers perform better on CentOS 5.5 and Fedora 12 than they did on Centos 4 or 5.2 or Fedora 10. Age of software has nothing to do with performance, moreover newer packages require more memory and cpu cycles owing to the inclusion of more features and eye-candy. It's true in some cases, but not always. For example, OpenOffice 1.1.1 was a pig at its time, new features added, programs refined, but it was still a pig till ver. 2.0. Then the real changes seemed to show up... on the next point releases the focus was more on performance than features. And on reaching OO.0 3.2 we got a swift office suite that can revolve circles around the older office suites. The story is same with Firefox. First, it was slow, then slower, but later some dramatic changes and it became a faster and less resource hungry browser at ver. 3.6. This trend in software advancement is obvious. First, we punch the features, define libraries and dependencies. Then focus shifts to remove the dead-weight and do some refinement to squeeze more performance out of it. CentOS is a great server and desktop. The statement is partially true. I've installed CentOS server only a few times. Since then it has been working well. It's steeped in the tradition of RHEL stability whose focus has always been the enterprise server. No doubt about it, CENTOS IS A GREAT SERVER. But the same is not true in case of desktops. It's more of a closed and almost a loser to catch up with the alway-merging diversity of desktop hardware. Taming it to meet your requirements is a Herculean task, though it can be done. CentOS is a fit-it and shut-it desktop where stability and security enjoy the most priority. Other linux poster-boys such as Ubuntu, Fedora and hundreds of Debian siblings still value stability (if not as paranoic as CentOS), but for them performance and feature-richness is all that counts the most. Needless to say, it's easy to customize them to your needs. Just do and compare the ease, success and benefits of compiling your kernel in Debian and CentOS. Dirty your hands at the package management tools of both the venerable distributions; add/remove programs, tweak them! You will know to the truth - RHEL clones are not as tamable as Debian siblings. The bottom line is: it's the best to deploy CentOS on servers, but you can find better alternatives for your desktops. A few days back I was watching the much hyped "Life" series on Discovery Channel. The episode on that day was on Amphibians and Reptiles. It was interesting, but what caught my attention was an advertisement on Bharat Operating System Solutions, a.k.a. BOSS. I was happy to know that Indian Government is waking up to such novel OSS initiatives. But that happiness faded away after a little combing of distrowatch and the project's own website. After all it is a Governmental project, and like other such projects - it's dated, ill-maintained, and never meant to be widely deployed. Developed by C-DAC (Centre for Development of Advanced Computing), it's yet another Debian fork with packages more dated than the current Debian stable, Lenny (Remember, Squeeze is close to freezing and is unofficially ready for mass consumption). BOSS' software stack has all the usual suspects such as - Web server, proxy server, Database server, Mail server, Network server, File and Print server, SMS server, LDAP server, plus all major Indian language packs. However, all these and the underlying kernel, desktop environments and userland is very old. Now, the latest, at version 3.0, it still sticks to linux 2.6.22, xorg 1.3, gnome 2.20, OOo 2.2 and FF 3. I ran it on my test machine (Dell Optiplex 360 - Intel Dual Core, 1GB RAM, 160GB HDD, Integrated Intel Graphics & Audio and Gigabit Ethernet). Looked sobre but worked poor. In comparison, Lenny was more responsive in almost every aspect - booting, program startup and overall stability. To all users looking for an Indian Free Linux, I would strongly recommend a vanilla Lenny (or Squeeze) + the required Indian language pack from Debian repo. I just wonder why India fosters such a distribution and drains big money into advertisements. Why anybody will ever choose BOSS over Debian, CentOS or Suse! CentOS is a venerable server OS, no doubt about it! But when it comes to desktop, the same OS is a pig - you can't tame it to your liking. I had mentioned a few of the centOS desktop annoyances here in my previous post. As the time goes on I keep on getting more and more problems. Who told it's a no-nonsense desktop! The USB issue still persists. And I now encountered a new problem related to file-roller. 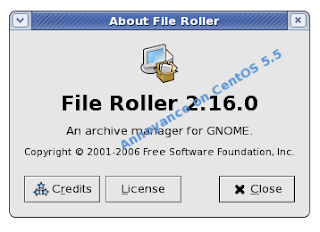 CentOS 5.5 comes with file-roller-2.16.0-2.fc6. Yes, it's the versions that originally came with Gnome 2.16. It's been very long... the package has been hardened by Red Hat in each of its point releases. CentOS also packaged the same, may be after doing some QA. 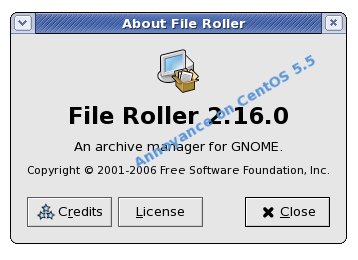 However, I found a weird (and critical) problem – file-roller is unable to roll at all in some cases, i.e., though it easily archives directories with a few homogeneous files (such as docs, spreadsheets and text files), it fails to archive directories with complex structures and varied file types (such as completely saved web pages including css, js, html and other files). First, I thought it's a regression, and went on to downgrade the package with the stock CentOS 5.2 disk. Nothing to my avail. Then I came to know the problem is deep-rooted in something that went wrong while upgrading. What Did I Learn? CentOS is not Debian, that means, you can't upgrade from one point release to another and be assured of a stable system. CentOS desktop behaves well if you don't fiddle. As I told earlier, you can't tame it to your liking the way you can do with a Debian system. At CentOS, I am clueless about this problem. Steadily CentOS is losing all its glory before me - I can't strip its kernel to suit my fancy, I can't tinker the runlevels and boot processes the way I did with Debian, I can't play with all the system internals the way I did with Lenny. Compared to Debian it seems more of a closed system. In short, if you want to deploy CentOS on desktops, don't fiddle. Better still, choose Lenny or Squeeze. They won't let you down. You can always use CentOS on servers. Here, server side is very much standardized. Good Heavens! There are some nice CLI goodies like tar, bzip, gzip.... they do the job. Edit: I got file-roller working the way it should after removing brasero (by mistake). But I still wonder why and how brasero messed up with the archiver.